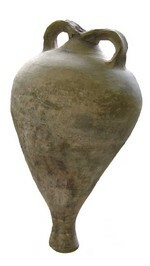 This amphora is characterised by a piriform body, with a knob-like base and a very wide shoulder. As in variant 1A, the neck is very constricted, with a hour-glass shape although the rim differs in having a sheer and gently everted face with triangular profile. The outer face is also characterised by a series of horizontal wavy ridges. The treatment of the handles is similar to that of variant 1A (Keay, 1984). In spite of these similarities, it is not certain that Keay 1B represents an evolution of Keay 1A. End of the third and fourth centuries AD. Unknown but possibly north Africa. No stamps have been found on this form, unlike the Type Keay 1A. Larger distribution than Keay 1A in the western Mediterranean: Morocco, Spain (Empúries), south of France (Saintes-Maries-de-la-Mer wreck, Arles), Italy (Ostia, Rome), Switzerland (Augst), Germany (Trier), England (Holborough). Probably wine, as the interior of known types are lined with pitch.